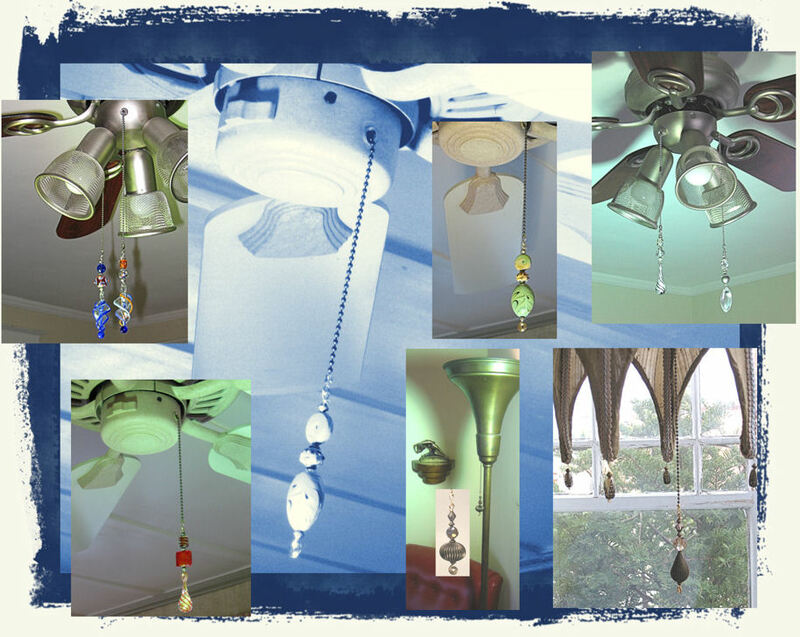 Hundreds of Ceiling Fan Pull styles! Easily attach our ceiling fan pulls with the quick click end connector attached to the included 4" length of chain which comes with each ceiling fan pull. You can also detach or attach extra chain length by easily snapping in and out at the base. 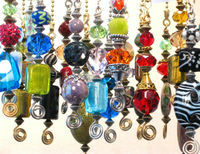 All Trace Ellements Ceiling Fan Pulls are original, handmade designs made in the USA. If you need a pull in quanities not available in stock please email us for upcoming availability or alternate choices, we're happy to help. Email tracy@traceellements.com with questions. Check out our huge selection of fan pulls (and Blind Pulls) and pick out the ones that suit you! Our fan pulls also double as hanging charms for your car's rear view mirror, as window suncatchers, for purses and keychain charms or anywhere you want to hang these whimsical accents. To use the fan pulls for these ideas simply disconnect the ball chain from the base connector and run the chain through the connector loop and reconnect the chain into the clasp end. In an instant you create a closed loop for hanging just about anywhere! Find It Fast! If you want to easily find a specific color, design or color use the Search Box at top right on the page. Type in keywords the describe what you're searching for (color, animal, style). Find modern and antique styles, wood and bone designs, whimsical children's pulls and all sorts of animal friends from the forest and sky. Enjoy finding your favorite! Simplify your life! Now you'll know which is your fan chain or light chain when you reach for the distinctive fan pull designs connected to your ceiling fan. Extra chain in either silvertone or brass is attached to each pull which simply and easily snaps in and out at the top or base of the included chain for easy connecting. Use your existing chain or snap out the old and keep only the new. You can even cut your chain with wire cutters and reattach the end connector for a the perfect length.